Revolutions often fail. The French Revolution culminated in the leadership of Napoleon, a ruthless emperor who tried to conquer Europe. The Russian Revolution brought years of civil war and a brutal regime headed by Stalin that made many Russian people even yearn for a return to the days of their monarch. How did the American Revolution yield a constitutional republic with greater freedom on a large scale than the world had ever seen? Successful revolutions never begin overnight. The American Revolution was 169 years in the making. Throughout the colonial experience important stones were being laid into the foundation of American independence. The distance British colonists enjoyed from their kings made direct rule nearly impossible. The Virginia House of Burgesses was the first representative assembly in the Western Hemisphere. 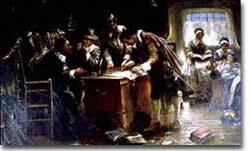 The Pilgrims committed themselves to self rule in the form of the Mayflower Compact before they had ever set foot on the new continent. Town meetings were quickly the norm throughout New England. The Quaker faith made equality a practice in the community and the meetinghouse throughout the Middle Colonies. All these important steps toward independence were already realized by the American colonists before 1700. Events in the early part of the eighteenth century made independence from Britain even more inevitable. The European Enlightenment filled the heads of educated Americans with thoughts of liberty and progress. The Great Awakening ushered in new faiths where equality between ministers and the congregation was the norm. American newspapers achieved a sound victory for a free press with the Zenger verdict. A tradition of ignoring English law was firmly established by New England smugglers, who patently ignored custom regulations. The colonists were no stranger to rebellion, as the masses from New York to South Carolina rose in demands of equality. Diverse peoples from all over Europe flocked to the British colonies with absolutely no loyalty to the British Crown. The stage had long been set for Americans to assert their independence from their British brothers and sisters. 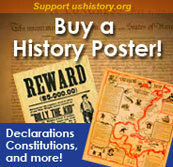 Many events transpired between the years of 1763 and 1776 that served as short-term causes of the Revolution. But the roots had already been firmly planted. In many ways, the American Revolution had been completed before any of the actual fighting began. Did you know that Newton was one of the inventors of the branch of mathematics called calculus? ... that Newton was friends with Edmund Halley of comet fame? ... that Newton took two years off so as not to catch the Bubonic Plague?